Skaters just completing the CanSkate program who are interested in developing their figure skating skills. It is a transition program to guide skaters from CanSkate which is 100% coach-directed, to StarSkate where skaters get a bit of independence. Junior skaters must have figure skates that have an entry level figure skating boot. SportChek carries a Jackson skate that would be just fine. No molded plastic skates. Skaters also need a helmet. Once the coach deems the skater ready, and mom and dad are fine with it, off comes the helmet! Junior skaters learn in a small group environment from professional skating coaches. They work on the base skills of figure skating like stroking and edgework, one-foot spins, sit spins and foundational jumps like waltz jumps and toe loops. When a skater is deemed ready, and interested, they will be invited into our Intermediate figure skating program. At a minimum, completion of Canskate stage 6 or at the recommendation of our Club's full-time NCCP Certified Coach, Annette Hiltz. What types of things do Junior StarSkaters learn? 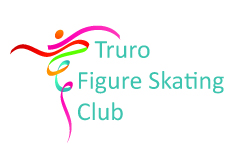 Watch these videos to get an idea of what our skaters are learning.